I am a huge fan of black bean burgers. They’re a great vegetarian or vegan alternative to regular burgers, and they’re really easy to make from scratch so you know exactly what’s going in your burger. And, they cook up really quickly, so they’re a snap to make if you’re in a rush but want a healthy meal. Sold yet? 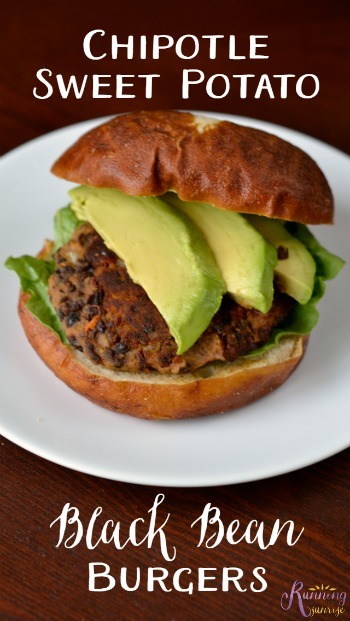 Read on for the black bean burger recipe! I made this black bean burger with sweet potatoes, which have lots of great vitamins and nutrients. I added in a chipotle pepper and some adobo sauce to give the burger a kick. If you like things spicy, it’s an easy tweak to add in an extra chipotle or two. It’s easy to tweak the recipe to include more or less of the things that you like and still wind up with a great burger. I started by steaming my sweet potato in the microwave because I’m impatient, although you could cook the potato however you like. While the potato is cooking, you can chop the onion and chipotle pepper and smash the black beans. I actually used my potato masher to mash my beans and the sweet potato and I think it worked really well. Once everything’s mixed together, all you need to do is quickly cook both sides of the burger in a skillet and you’re ready to eat! Not only are these burgers easy-to-make and delicious, but they’re also really quick to make as well! Smash black beans with a fork or masher until well-pulverized. Combine the beans and the rest of the ingredients together, including 2 tbsp olive oil, in a bowl until well mixed. Add extra diced chipotle peppers for extra heat if desired. Divide the mixture into four to six parts, depending on the size of the burger desired. Heat 2 tbsp olive oil in a skillet over medium heat. Cook both sides of the burger until browned. Serve alone or on a bun. Serving suggestion: top with a few slices of avocado. Linking up with Tina and Deborah for Meatless Monday! Are you a fan of veggie burgers or black bean burgers? Oh my gosh mouthwatering! We love bean burgers and sweet potatoes in our house, so I definitely will be throwing this on our menu soon. Thanks for the recipe! I”m not so great with beans, but these still sound fantastic. I will just have to find an alternative! Maybe zucchini or something like that! Love the flavors. Yeah, zucchini could work. I think the sweet potato could hold everything together. Or anything else that’s kind of mashy. Yumm!! These looks amazing and super easy. I’m always looking for quick easy meal ideas like this for when my husbands away. I was amazed at how quick and easy these were to make, and aside from the chopping there’s very little cooking involved. If you try them let me know how you like them! I love black bean burgers! Can’t wait to try…I’ve never added sweet potato before! Definitely try it! The sweet potato just helps bind together all the ingredients. And it’s tasty and healthy! This looks great! Most black bean burgers I get at restaurants don’t taste that great to me. Even though they are advertised as a healthier option, they don’t taste particularly healthy. I think if I made them at home I could remedy that! Yes! You can add in as many spices as you want. I’m a huge fan of chipotle, so I made sure to add that into this burger, but you could easily play around with the flavors. I’ll have to wait until after my race this weekend to try these out but they sure look awesome! I’m always up for anything that will give me some extra toots! Love veggie and black bean burgers. So good. This one sounds and looks awesome. Thank you so much! Hope you like it if you try to make it! Yes, definitely do try it! It’s a great combination, and you can play around with spices to find a combination that you love. Yum, that sounds delish! I am all about enchiladas–one of my very favorite foods! Oh yum! These look delish! So excited for BBQ and burger season! Thank you! I’m super excited for BBQ season, too! It’s finally getting warm enough! Two of my favorite ingredients in one tasty burger. Yum! This recipe looks awesome! I made black bean burgers for the first time last week (hehe), and loved it more than I thought I would. Thanks, Jess! Aren’t they so easy to make and delicious? One of my new go-tos. I love veggie burgers and black bean burgers, but lots of the store bought ones aren’t gluten free. Love that these are. I love black bean burgers and really like the addition of the sweet potatoes in here. Yummy yum thanks for sharing and joining us for Meatless Monday today. Of course, it was my pleasure! I loved adding the sweet potato because it really helped bind the burger together better than a beans-only burger, too. Definitely do! I honestly tend to keep them in my freezer–I’ll freeze the rest of the can that I don’t use immediately so that I can add them to various dishes. Love chipotles in chili, for example. Now this is my kind of burger, it looks amazing! I bet it tastes as good as it looks!! It was really good! Even my husband liked it, and veggie burgers aren’t really his thing. You are most welcome! And you’re right, they’re super easy, which is why they’re right up my alley. 🙂 Let me know what you think if you give them a try!